Rikki Scott was born right here in Michigan’s Great Southwest in Benton Harbor. She was raised in Coloma (Comets!) and currently lives in Niles (Vikings!). 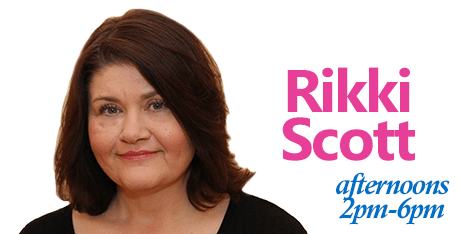 Rikki spent several years as a radio gypsy working on Long Island, NY, in Louisville, KY, Charlotte, NC, and Cincinnati, Ohio before deciding to come home. Rikki lives with Luke, her college-age son, who won’t leave home. (Maybe if she stopped doing his laundry!) Rikki also shares her home with Norman the Mutt and Harvey the Morkie. Rikki will watch any Law and Order, but prefers SVU. She also loves Criminal Minds and has an unhealthy obsession with Stranger Things and Orange is the New Black. Rikki is an avid reader and enjoys anything from Pulitzer Prize winners to the occasional bodice-ripper romance. When Rikki is not on the air, you will find her trying desperately not to cook or wondering what her life would have been like if Hugh Jackman had accepted her proposal.